Did I mention I work from home? I must have, somewhere along the way. In any case, I do. Work from home that is. Not in the freelance, make your own schedule and take your own projects kind of way, but in the fully-employed, full-time, shifting schedule kind of way. A lot of people have the misconceived notion that I type blissfully on my keyboard everyday, writing about food and blogging about my random, and (let’s be honest) often trivial thoughts. Well…I do do that. Otherwise you wouldn’t be here reading this now. But it’s something I do during my free time…you know, that time after work when other people are heading to the gym? Yup. I choose food over the gym…as I have most of my life. Anyway, enough of my lifetime avoidance of the gym and anything even vaguely resembling exercise. So. I work from home in a fairly ordinary job, which only gets complicated when I try to explain it, so I won’t even try to do that here, where most of you have come for something tasty and edible. It has all the trimmings of a regular office-job (shifts, schedules, team buildings and Christmas parties!) in a home-based setting. It seems like a good compromise, but really, as anyone who works full time from home can tell you, it is quite the juggle. Just imagine having your whole house and all its occupants in your office…pandemonium! But it is a juggle a gladly take on. Because I can bring my daughter to school every morning. Because I can go to the bank during off hours so there is hardly a queue. Because the opportunity to be close to my children every day (even if I am behind a locked door – yes, boundaries are very important when you work from home!) is priceless. Because I love wearing flip-flops to work. Because I can have long lunches with my mom when I’m doing the night shift. Because traffic is bad and I have motion-sickness, and now I don’t have to commute. Because now all I have to spend for is “fun” clothes. And because I can make my own lunch! – Make the sriracha cream sauce first: whisk together the mayonnaise, sriracha, and condensed milk. Start with 2 tablespoons sriracha and work your way up if you’d like more heat. Set this aside in the fridge. – In a small bowl, whisk the cornstarch together with 1/4 cup water and set aside. – In a saucepan over medium heat combine the soy sauce, brown sugar, ground ginger, garlic powder, honey, and 1 cup water. Mix well and bring to a simmer, then stir in the cornstarch mixture. Simmer, stirring, until the mixture has thickened enough to coat the back of a spoon, about 3-5 minutes. Take off the heat and let it cool down to room temperature. – In a bowl or large ziplock bag combine the salmon fillets and the teriyaki marinade, tossing well to coat all sides. Marinate for 30 minutes to overnight, turning the fillets occasionally. – When you are ready to cook, place the salmon fillets, along with the marinade, in a lightly greased baking dish and bake in a pre-heated 400F oven for about 20 minutes (or until fish flakes easily with a fork), basting the salmon with the marinade in the dish once or twice during cooking. – Once cooked, remove the salmon from the remaining marinade (now its sauce) in the baking dish. Place the sauce in a small saucepan and give it a quick simmer, just a minute. 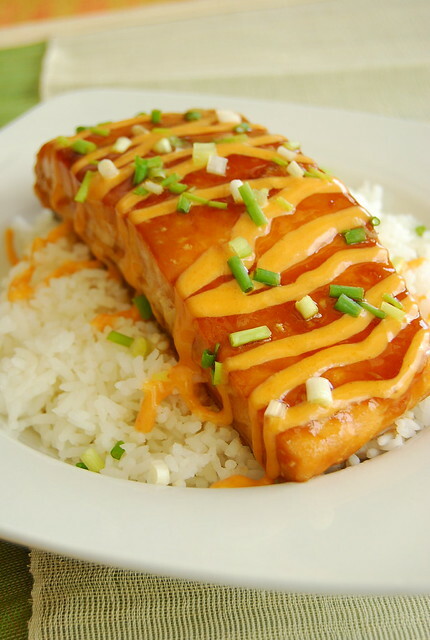 Serve the salmon with the remaining teriyaki sauce, the sriracha cream sauce, and a smattering of sliced green onions. If you are pressed for time (and who isn’t nowadays?) you can make the teriyaki marinade and the sriracha cream sauce a day before, perhaps sticking the salmon in the marinade already. And then it will just be a matter to sticking the whole lot in the oven the next day. The ease with which you can make this dish however it totally overshadowed by how delicious it is. Be prepared for the addictive quality of the sweet/spicy sriracha cream sauce. Just be prepared! Also, have rice, freshly cooked, and hot, and plentiful. Whether you work in an office or at home (in a closet, like me, if you absolutely must know), we are all putting in hours, busy and tired and in need of sustenance. I hope this dish helps put a little more spring in your step, as it did in mine. We can do this worker bees! You had me at salmon. I love this dish, so simple yet so much flavor in it. Must try this tomorrow night. And yes, I get you. I work from home, too. Only those who have the same work arrangements understand. We can rant together next visit about that. Thanks for the recipe, J! Hi Betty Ann! This is really easy and so delicious! So happy I chanced upon the recipe 🙂 Hay, the triumphs and travails of working from home!! The Sriracha cream sauce is amazing. It elevates the flavor of this dish. Hi Jeff! I agree…I love it! !